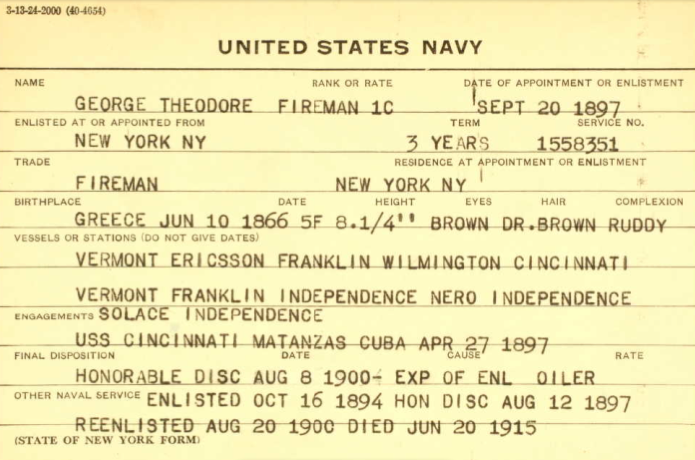 Ancestry.com has a database titled NEW YORK, SPANISH-AMERICAN WAR MILITARY AND NAVAL SERVICE RECORDS, 1898-1902. There are 31 men, born in Greece, who are in these records. You will have the ability to print a copy of the actual record. If you do not have a subscription to Ancestry.com, most public libraries offer FREE access. This database contains index cards listing details extracted from federal military service records for New York soldiers during the Spanish-American War, Philippine-American War, and the “Boxer Rebellion” in China. They were created by the New York Adjutant General through the Bureau of War Records, and are organized into subseries for U.S. Army officers, U.S. Navy, U.S. Enlisted Army, and U.S. Marine Corps.